Click the image to access the report. financing mechanisms for investing in water infrastructure in the United States. 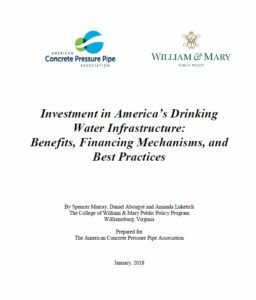 In addition to providing a comprehensive overview of the various financing tools available to support drinking water infrastructure investment, the report examines factors that mitigate their use by water system owners and explores both the economic and public health benefits associated with drinking water investment. There is a severe pattern of underinvestment in water infrastructure across the United States. It is estimated that as much as $1 trillion will be needed to meet the needs of a growing society and repair our rapidly crumbling system. Adequate financing will be essential to keeping pace with this need for investment. This report provides an overview of the currently available sources of financing and distills available literature and interviews with water structure owners to offer a set of best practices for financing water infrastructure. Additionally, this report assesses the return on investment for funds spent on water infrastructure improvements with a unique focus on quantifying the public health benefits of those investments. The current system for funding upgrades and expansions to drinking water infrastructure relies heavily on user-fees and the operating and maintenance budgets of water structure owners. Because of the large need for investment and low price of water to maintain affordability, this system does not provide enough funding to meet existing needs for upgrading and expansion. Aside from the inadequacy of funding from current sources, in many cases water infrastructure owners do not know what their maintenance and expansion needs are. No standard auditing practices exist across the industry and, as such, it is the responsibility of water structure owners to develop their own monitoring and evaluation methods. For those water structure owners that are aware of their needs, there are often higher priorities to which funding is directed, leaving water systems to age past their useful lifespan. On the Federal level, a number of agencies offer loan or grant programs in support of water infrastructure including the Environmental Protection Agency (EPA), U.S. Departments of Agriculture and Housing and Urban Development (HUD) and the Bureau of Reclamation. However, our research finds that these programs are underutilized in large part because municipalities lack the technical or financial capacity or willingness to plan for a loan or meet stringent regulations. This report also reviews the types of funding and financing offered at the state level. Grant programs, which appeal to debt-wary public officials, are the most popular. These are followed to a lesser extent by loan programs and, in a small number of states, dedicated revolving loan funds. Tax-exempt bonds: Our research suggests that tax exempt bonds are the most popular and cost-effective financing mechanism for municipalities. However, access to low-interest bonds as a method of financing depends on the economic stability of a municipality and thus may be out of reach of cities with low credit ratings. Promoting Collaboration: Our research found that municipalities and water structure owners are more successful when they work together. Creating consortia of public or private partners allows localities to build their technical capacity and increase the efficiency of their cost-models. Blending Funding and Financing: It is difficult for any one source to address extreme underinvestment. Combining a rate-based funding scheme with financing at the local, state, or federal level increases the feasibility of water infrastructure projects. This report presents an analysis of the economic impact of water infrastructure spending in two ways: pure economic impacts and public health impacts. The first is a measure of the economic activity that is generated when governments invest in water infrastructure. This report finds that each dollar invested in water infrastructure generates between $0.40 and $2.20 in economic activity. Public health impacts are analyzed in two ways: prevention of common waterborne diseases and reduction in lead content. A panel of specific diseases is used to estimate the value of preventing some common waterborne illnesses; lead content in drinking water is connected to a reduction in lifetime earnings via the detrimental effect lead has on human development. Our analysis finds that investment in water infrastructure generates between $142 and $1,438 in public health benefits per dollar spent. Urge Congress to maintain and expand tax-exempt financing and promote collaboration. Urge water structure owners to assess the condition of their infrastructure and plan for improvements. Request that the Government Accountability Office (GAO) investigate the effectiveness of federal financing options. This report contributes to the literature on water infrastructure financing in several key ways. It identifies fundamental flaws in the federal financing landscape and uncovers ways in which municipalities have succeeded in investing despite the challenges. It also presents a new perspective on the return in investment associated with water infrastructure, revealing that the public health value of investment is substantial and worth taking into account when formulating policy.